DCM-PRO is the fastest solution for the installation of a heated decoupling system in all areas, installing electric underfloor heating in minutes with less tile adhesive. DCM-PRO is a new innovative electric underfloor heating system from Warmup that is proven to protect tiled floors from cracking, as tested by ANSI 118.12:5.4 (American National Standards Institute). Consisting of a decoupling membrane with a heating cable, the DCM-PRO makes the installation of electric underfloor heating quick and easy. The system suits all floor types and protects the floor finish from cracks and damage caused by seasonal temperature changes that can affect the sub-floor. 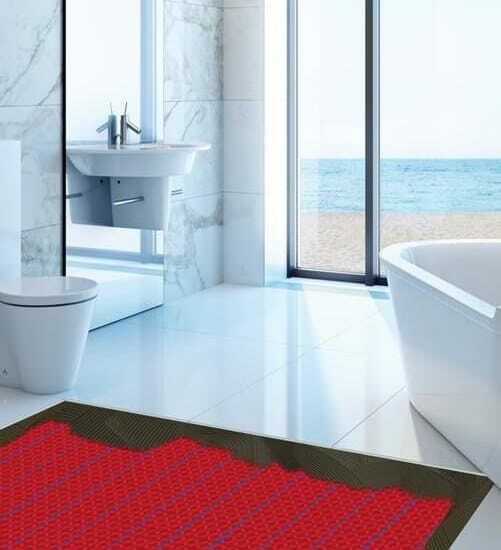 Tiles that are particularly prone to cracking benefit a lot from the anti-fracture matting of DCM-PRO; hence why this underfloor heating system is always recommended with tile flooring. Consisting of an decoupling membrane with a heating cable, the DCM-PRO makes the installation of electric underfloor heating quick and easy. How Does the Decoupling System Work? 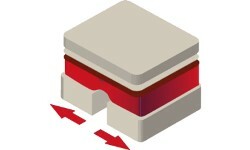 The self-healing decoupling layer of the DCM-PRO mat protects floor finishes from damage. The layer contracts and expands to deal with structural movements in subfloors due to seasonal changes, preventing damage from occurring to floor coverings. The patent pending self-adhesive underside of the mat attaches directly to the subfloor and eliminates the need for an adhesive layer, significantly reducing installation time. The DCM-PRO can be covered with self-levelling compound, allowing it to heat and protect any floor covering material that is certified for use with underfloor heating. This includes tiles, engineered wood, vinyl and carpet providing a constant output of 150W/m2. The clear sizing based on the castellations of the mat provides quick and easy planning for installation, 2m² of mat fits exactly 2m² of area. Sizing can be adjusted to increase or decrease coverage and power. The DCM-PRO Cable is designed to be easily fitted in the mat without any tools. The cable is highly-flexible, durable and provides maximum reliability. Comes with a life-time warranty when installed with the DCM-PRO Mat. DCM-PRO decoupling membrane has an effective self-adhesive backing that does not require additional adhesive to firmly attach it to the subfloor, saving both time and cost. Just make sure that the subfloor is always clear from dust and clutter before attaching the membrane to the floor. The sizes of the mat are designed for convenient sizing so that 2m2 of cable fits exactly 2m2 of mat. The spacing of the cable can, however, be adjusted to increase or decrease coverage and power. You don’t need any tools to install the system – this makes applying the cable in equal parallel lines to the castellations of the mat effortless. The cable’s highly-flexible and durable qualities contribute further to its ease of installation. The cable comes with a lifetime warranty when installed with the DCM-PRO Mat. After this, the DCM-PRO Mat will be covered with self-levelling compound, allowing it to heat and protect any floor covering material that is certified for use with underfloor heating. This includes tiles, engineered wood, vinyl, and carpet. As market-leaders in underfloor heating Warmup promises that this premium quality product is guaranteed for the lifetime of your floor. DCM-PRO decoupling membrane has a very effective self-adhesive backing that does not require additional adhesive to firmly attach it to the subfloor, saving both time and cost. Just make sure that the subfloor is always clear from dust and clutter before attaching the membrane to the floor. The sizes of the mat are designed for convenient sizing so that 2sqm of cable fits exactly 2m² of mat. 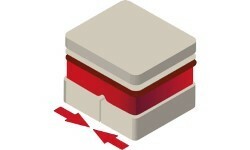 The spacing of the cable can, however, be adjusted to increase or decrease coverage and power. You don’t need any tools to install the system. This makes applying the cable in equal parallel lines to the castellations of the mat effortless. The cable’s highly-flexible and durable qualities contribute further to its ease of installation. The cable comes with a lifetime warranty when installed with the DCM-PRO Mat. As market-leaders in underfloor heating, Warmup promises that this premium quality product is guaranteed for the lifetime of your floor.